James Bond 50: The Complete 22 Film Collection on Blu-ray. All of the 22 “James Bond” feature films and over 130 hours of bonus features including never seen before content from the Bond archives. The boxed set also includes an open slot for “Skyfall,” which is now available. The wolrd of James Bond 007 films have a style, a look, an attitude that is indicative of James Bond. Ranging from the cars, to the villains, the music and the women, James Bond films stand on theirown. The World of Bond captivates the unforgettable moments of danger, seduction, adventure and a pinch of distinguished humor that Bond fans love, from the beginning. Included is the complete 22 film collection on blu-ray, two discs per page, 1 movie per disc. An open slot even included for when Skyfall comes out on disc! 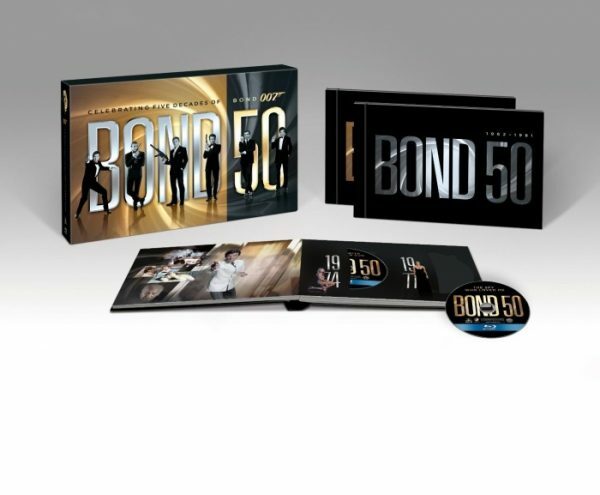 Now you can have the entire James Bond: 50 Bond 50: The Complete 22 Film Collection on Blu-ray together in one complete set! Plus a slot for SkyFall!